This remarkably detailed view of early 19th-century Brooklyn is of Francis Guy's neighborhood, seen from his studio on Front Street. 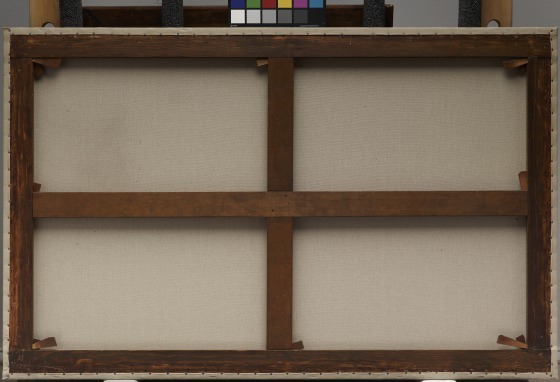 It is also one of the largest and finest surviving examples of the topographical tradition of American landscape, a school of painting focused on describing the cities and views of the young republic. The businesses and homes along Front, James, and Fulton streets were so clearly identified that a reviewer for the Columbian magazine in May 1820 enthusiastically praised the accuracy of the various compositions (Guy painted at least three similar Brooklyn views):"The stables, barn, and old back buildings of Mr. Titus stand well contrasted with the handsome buildings of Messrs. Sands, Graham, and Birdsall, &c.;"
Guy, a London silk-dyer, came to the United States in September 1795 to continue his career in New York and Baltimore. After a 1799 fire destroyed his business, Guy became a full-time painter, despite having no formal artistic training. 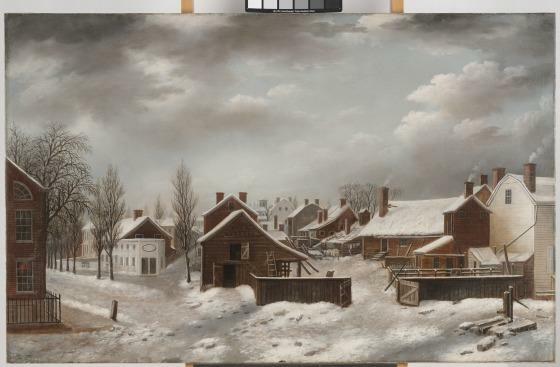 With the assistance of patrons such as Baltimore's noted early collector Robert Gilmor, who allowed him to copy pictures, Guy developed a charming, distinctive set of views of Baltimore's landmarks. 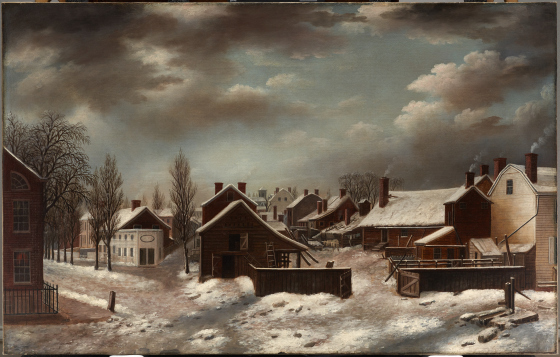 After moving to Brooklyn in 1817, he mounted his most ambitious exhibition, which included this painting, in 1820 at the Shakespeare Club. Sadly, Guy died before the run of the exhibition had finished. William Dunlap, an early American art historian, wrote dismissively in 1834 (28 years after having met Guy): "He attracted some attention by his attempts at landscape painting, and finally made it his profession and found employers. . . His style was crude and harsh, with little to recommend his efforts, which now would not be tolerated." Critical opinion has warmed—today Guy is highly regarded as one of America's earliest and most important landscape artists. William Keyse Rudolph, DMA label copy (2008.23.McD), August 2008. Learn about Francis Guy (1760â0131820). 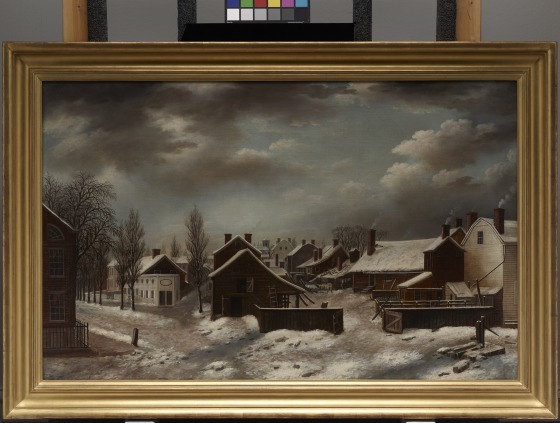 The area shown in Guy's Winter Scene in Brooklyn is now occupied by the traffic lanes leading to the Brooklyn Bridge and the Brooklyn-Queens Expressway. 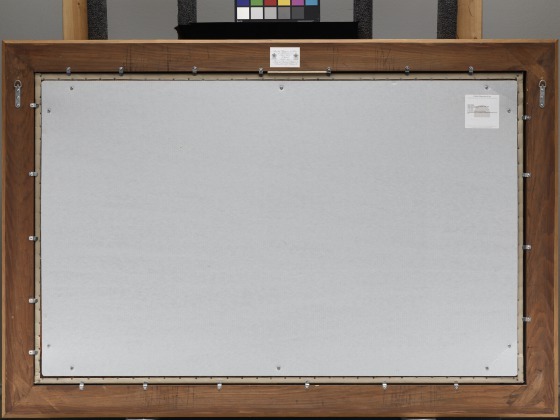 For decades this work greeted and delighted visitors to the New York Public Library Reading Room near Bryant Park, before its sale at auction in 2005. 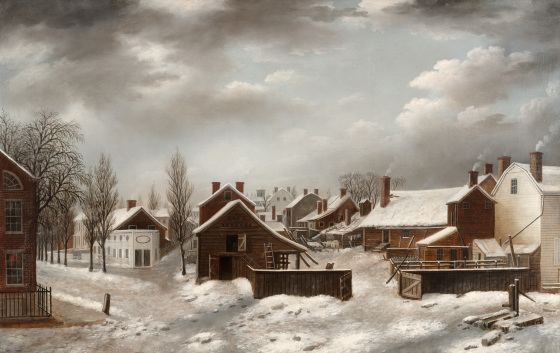 Watch Dr. Margaret C. Conrads, Director of Curatorial Affairs, Crystal Bridges Museum of American Art, discuss one of Guy's depictions of his Brooklyn neighborhood. 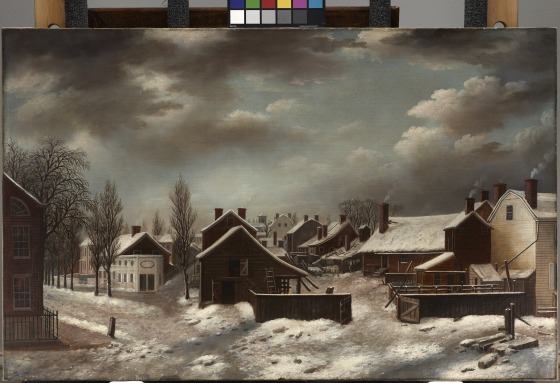 Check out this seasonal variation on Guy's topographic theme, located in the Brooklyn Historical Society.